Which display mode do you prefer? 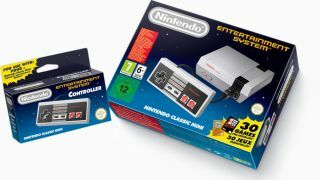 According to a newly updated promotional page for the NES Classic Edition (also known as the Nintendo Classic Mini in the UK), retro gamers are going to get a choice of three display modes when they finally unpack the compact console. First there's "Pixel Perfect", where each pixel is rendered as a perfect square (and therefore gives you a perfect square on your big screen). As Nintendo points out, this lets you "see the games exactly as designed" even on modern hardware. Then there's a 4:3 mode for "the original NES game look", which is going to stretch your games ever so slightly. This matches the same aspect ratio that most original NES gamers, playing on a cathode ray tube (CRT) television, will be familiar with. Finally, there's an intriguing "CRT filter" mode for that authentic look, designed to look as much like an old television set as possible - it even comes with fake scan lines and is the one to use if you really want to feel like you're in an episode of Stranger Things. Nintendo has also revealed a little more about the suspend points you're going to be able to use to save your progress. Up to four suspend points can be saved for each of the 30 built-in games, and they can be locked too, so you don't actually save over them. The classic console, shrunk down for a new generation, is going to be available to buy from 11 November for £49.99 in the UK, US$59.99 in the US and AU$99.95 in Australia. Once we get our hands on one, we'll tell you how it plays.